For a guy whose career has evolved more by serendipity than design, Ben Dickey’s professional journey has turned into one heckuva ride. Its not every day an obscure musician’s famous actor/ director friend hands him the lead in a passion-project indie film, and he not only winds up sharing the screen with one of his musical heroes, he also wins a Sundance Film Festival Special Jury Prize for Dramatic Achievement in Acting and a Variety magazine for your consideration plug for a Best Actor Oscar nomination. 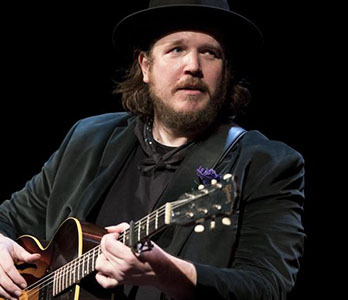 Dickey’s acting debut in Blaze, Ethan Hawke’s biopic about doomed Texas singer-songwriter Blaze Foley, has already led to more roles, including their pairing as bounty hunters in The Kid, a western directed by Vincent Donofrio. But just as exciting, as far as Dickey’s concerned, is the opportunity it provided to record with that musical hero, longtime Bob Dylan guitarist Charlie Sexton (who played Blaze’s other troubled Texas songwriting legend, Townes Van Zandt). After they did the film’s original cast recording (on Light in the Attic Records), Sexton produced Dickey’s solo album, A Glimmer on the Outskirts. That inspired Sexton, Hawke and Blaze executive producer Louis Black to form SexHawkeBlack Records, a new Austin-based imprint under the umbrella of Nashvilles Dualtone Records. Dickey’s March 7, 2019 release is the label’s first. It’s hardly Dickey’s first recording foray, however. In fact, he says, he preferred the idea of forming a label to shopping for one because he’d been signed before and still bears scars from watching the dream morph into a momentum-sucking nightmare. But SexHawkeBlack president Erika Pinktipps happens to be friends with Dualtone’s founder; that connection quickly turned into an actual alliance. We’re all doing this together, Dickey says, [it’s] a group of people who all care about each other and have similar artistic arrows pointed in the same direction. Tickets may be mailed, if time allows, or made available at box office “will call” list. Box office opens a half-hour before the show. ©2010-2019, Santa Fe Performance Exchange; all rights reserved. Media/photos are copyrighted by the artist, artist representative, or photographer and used with permission.